Is Yunnan black tea dian hong or hong cha? Terminology for Chinese teas can be confusing. For example, in China hong cha is the term for ‘red’ tea – what we in the West call black tea. It can be used to describe any tea from any of the black tea producing regions of China. For example: one might refer to a Fujian Zheng Shan Xiao Zhong as a northern Fujian hong cha or a Keemun black tea from Anhui Province as an Anhui hong cha. Conversely, hong cha teas of Yunnan Province are called dian hong instead. Dian is an old historical name for parts of today’s Yunnan Province, so dian hong is still how Yunnan black tea are referred to. Some say that dian hong should just refer to the modern-style plantation style teas and not the forest teas made from indigenous varieties of old tea bush varietals. We, on the other hand, generally use the term dian hong to mean the opposite. Yunnan has such a long history of producing both Pu-erh and dian hong that we think dian hong should be reserved for tea in the historical since – the traditional, small village teas made from forest gathered leaf materials. New harvest seasonal Yunnan black teas are delicious – but rested or aged versions of these teas can be twice as rewarding! Tea Trekker’s Yunnan black teas are plucked in various types of tea gardens – older plantation gardens and forested arbor bushes and trees (wild to semi-wild plants). Not all black tea ages well, but we find that hand-crafted teas from both Yunnan Province and regions of Eastern China keep and age wonderfully. The bushes and trees that are plucked to make out Yunnan teas represent different generations of plants and are comprised of many unique cultivars found growing throughout the heavily forested mountain tea growing regions of Yunnan. These varietals and cultivars are broad-leafed varieties – known collectively as dayeh – that produce large, long leaves that reflect the richness of their forested habitat and the plants close genetic connection to the wild tea trees of Assam India – Camellia assamica. This habitat and size is one of the reasons why Yunnan black teas are so rich and full in the mouth. Tea such as this offers the luxury of time as they will store well and maintain and develop flavor complexity for several years. We love Yunnan dian hong and prefer to drink them when they have mellowed a bit – one or two years after manufacture. In most cases, the teas can be kept for much longer. The key to ageing these teas is proper storage (cool and reasonable airtight – a ceramic jar is ideal) which will serve to underscore and preserve the inherent concentration of flavor elements that premium Yunnan leaf has in abundance. We have many Yunnan dian hongs in our repertoire, and our Yunnan Tippy Golden has one of the largest and most loyal fan clubs of any of these extraordinary teas. 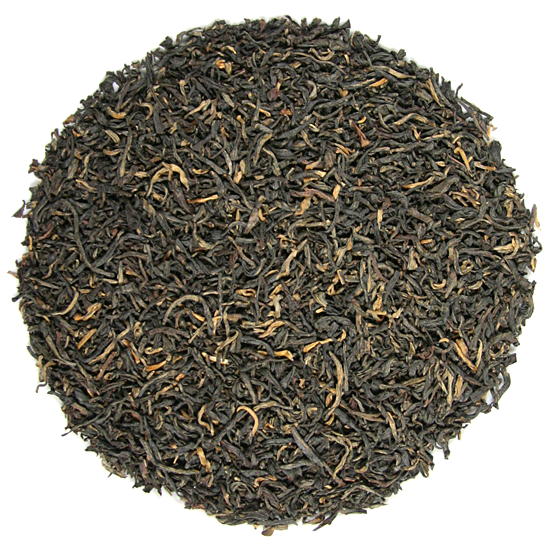 So what is it about Yunnan Tippy Golden that is attractive to so many diverse tea drinkers? Well, we think it is basically that this tea represents a taste and flavor that just satisfies many palates, whether drunk hot, cold, with dairy, honey, sweetener, or many of the other additions that tea enthusiasts add to their cup these days. We recommend that it be drunk straight-up, because it has just enough of the ‘honeyed-caramel’ Yunnan taste that pleasantly rounds out its moderate strength and brisk astringency. Up-front, this cup has so much flavor that you will find your taste buds singing all around the front of our mouth. But then the ‘returning flavor’ phenomenon begins and you will be able to enjoy Tippy Golden’s lingering flavor on your palate for quite a while after you swallow it. This is an indication of concentrated flavor in the leaf and high-quality finish-firing. If you tend to short-steep your tea (2-3 mins) try adding more hot water to that leaf and steep for an additional 5-7 minutes. This second steeping may surprise you!